I was fortunate enough to go for a pair of boat dives with my friend Jack Hinz yesterday. The weather was just great – on the way out, we could see Boston in the distance. Because of the wind direction, Jack decided conditions were good for a dive off the Dry Salvages, a rock outcropping off the coast of Rockport. The Dry Salvages are so called because they’re visible above water at high tide, unlike their little sisters the Little Salvages. Once we were anchored, we could see seals in the water. There were four of us diving. Jack, Paul and Barbara have been diving together for a long long time. In fact, Jack and Paul were the first divers on the Chester Poling when it first sank in 1977. For the first dive, we split into two groups – Paul and I on the first dive, then Jack and Barbara went in once we got back. The water was relatively warm and comfortable, at least by New England standards. Paul was lobstering; I was just looking. There were tons of little fish flitting around the bottom, and lots of fairly small lobsters. The little fish are frustrating to try to shoot — they move very fast, and it’s hard to get close enough to get a good shot. At one point, I looked up, and saw a large pair of tail fins vanishing into the murk, but then nothing. We continued on. Then I looked to my right, and saw the seal, just looking at me. It was probably around four feet long. 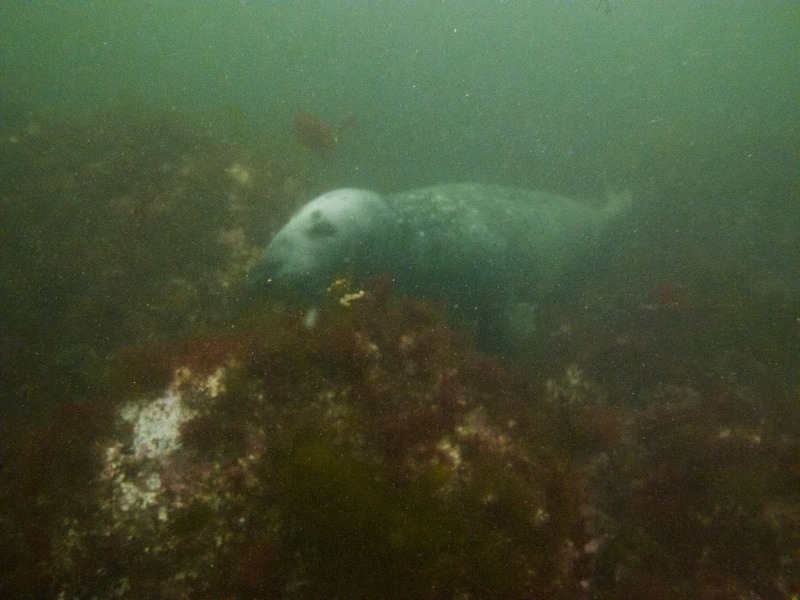 To me, seals underwater sort of look like extra-terrestrial dogs, albeit bigger. They have the same kind of expression, but much smoother looking. This one also had darkish circles around its eyes. This one was quite patient with me while I took its picture. I quickly discovered that my flash was useless this far away, so I increased the ISO and switched to existing light. This entry was posted in Diving, Photography, Uncategorized and tagged Cape Ann, crab, diving, lobster, photography, Seal, starfish, underwater by Ted. Bookmark the permalink. Sounds like a nice experience! I have to say I miss the diving. Thanks for posting the pics! My sister finally gets a chance now to see what I see down there. I wish I had gotten a glimpse of those seals….